The Gypsy Palace Tarot by Nora Huszka is a potent deck for intuitive readings that articulates the “death and the maiden” motif. Gypsy Palace showcases a postmodern macabre aesthetic that blends tribal-aboriginal inspirations with Fauvist flavors. In other words, I love it. Your deck, when you order it from Huszka, will come with a beautiful drawstring bag that matches the fabric of the accompanying guidebook. (However, that drawstring bag is not shown here.) If you’re going to get the Gypsy Palace Tarot, then I recommend ordering the set with the guidebook. You won’t regret it. I’ll show you why later on in this review. This is a self-published deck that you can buy from the deck creatrix herself, via Etsy. You’ll want this deck in your collection if you’re a collector and you’ll want to work with this deck if you consider yourself an intuitive reader. There is also this “fortune-teller-traveller” boho consciousness infused into the Gypsy Palace Tarot deck that is going to resonate strongly with those who identify as a fortune-teller. Earlier I had mentioned the “death and the maiden” motif and this danse macabre aesthetic that’s a tinge Fauvist. Here you can really see that in full display throughout these bright, bold Majors. Huszka’s deck follows the earlier decks in tarot history where Key VIII is Justice and Key XI is Strength. You’ll see how she flirts with traditionally ascribed imagery and notations, as with The High Priestess or The Empress, but really it would make little to no sense at all to transplant your textbook interpretations to this deck and try to apply a TdM, RWS, or even Thoth filter for these cards. Instead, story-tell through the emotions evoked by the figures, the color symbolism, and the scene depicted in each card. Huszka also brilliantly instructs on how to read these cards intuitively, as I’ll get to when I address the guidebook. By the way, the cardstock is wonderful! I’m very, very impressed with the quality of this deck. It’s a matte finish and made from thick, sturdy stock. The red borders is just beautiful and amplifies the power and potency of this deck. You feel the deck’s strength here, for sure. There is magical vibrance coded into the imagery and if you’re receptive and open about tapping into that coded magic, you’re going to get some really powerful readings with the Gypsy Palace. To me, some of these cards, like the Ace of Wands pictured above, or the Four and the Seven above, have this paleolithic cave painting vibe. It feels channeled. It feels feral. It strikes at the heart of a primal subconscious that this particular deck taps into with strident clarity. There is also a folk art feel to the deck that lends itself well to those who identify as fortune-tellers. There’s an unabashed confidence, charm, and mystic flavor that will settle this deck right at home next to a crystal ball, in a dim candle-lit room smelling of patchouli, and a gem-studded hand hovering above a spread of the Gypsy Palace Tarot. I get the distinct sense that the artist Huszka is influenced by Fauvism. The bright bold coloring may be a dead giveaway. But it’s also in the fierce brushwork, abstract impressionist lines, and the heavy reliance on color to evoke emotion. Above you see the courts for the Wands (top row) and Swords (bottom row). I love that she’s numbered the courts for you. The 11 for Pages emphasizes the sense of messaging and that of divine messengers. The 12 for Knights is about energy, activism, vigor, and the development of one’s strength and prowess. 13 for the Queens is perfect–intuitive, connected to the occult, spiritually receptive, and tuned in to Spirit. Kings are 14– ambition, forbearance, and a strong command of material success. When reading with the Gypsy Palace Tarot, you may need to abandon what you think you know about the tarot via the Tarot de Marseille, Rider-Waite-Smith, or Thoth systems. Instead, let this deck teach you how to read with it. Let this deck and the metaphysical forces that Huszka has programmed into this deck guide you in reading intuitively. Above are the first ten cards from the suit of Pentacles. The cards are numbered at the top and on the bottom in the yellow text box, you’ll see the suit name in four languages. If you’re not readily familiar with the deck yet, then these will be critical to helping you identify each card, since the imagery deviates substantially from any of the commonly adopted tarot systems. I also consider this deck an art deck. To me, an art deck is the display of an artist’s portfolio of works woven through the structure of a tarot deck and, through that synthesis, creating a divinatory system that uses art to trigger creative-intuition. So art decks work well for reading, for certain types of readers, namely the ones who go the route of intuitive reading and story-telling with the tarot. Also, art decks are such a hot commodity for deck collecting. As a collector, I horde art decks and Nora Huszka’s Gypsy Palace Tarot is definitely one to horde. The guidebook for the Gypsy Palace Tarot is hand-stitched and bound together. That is awesome. I love this Rough Guide. I treasure my copy of the book. In the front pages, there’s that statement I agree with: The cards never lie. Page 6 of the guidebook offers a step by step inquiry for intuitive reading with the deck. I love that the last line on the page says to “be curious, creative, and playful,” because those are apt adjectives for describing this deck! Above you’ll see a sample page spread of card meanings from the guidebook. It helps to inform you of where the deck creator is coming from with her inspiration for each card. I also adore the fortune-telling tone of the entries (e.g., cause of headaches). There truly is a lot of whimsical charm to this deck, and yet it’s seriously powerful for, well, fortune-telling and like divinatory purposes. Several tarot spread ideas are provided. Here I’m going to try out the 3 Card Spread, but with a slight twist. I’ll draw three cards, and left to right, they’ll represent “Obstacle,” “Situation,” and “Key.” You’ll choose which you want a quick revelation on. So you’ve got it? Have you chosen? Obstacle, Situation, or Key. All right. Here we go. If you chose Obstacle, your card is the Ten of Cups. If you chose Situation, your card is the Queen of Pentacles. If you chose Key, your card is the Queen of Cups. Who do you see in that card? What symbols leap out at you? What do those symbols mean to you? Which color dominates on the card? What is the color symbolism here? I’ll play along. I had chosen “Obstacle,” so my card would be the Ten of Cups. What is your first impression? For me, here I see an unabashed, confident woman who is connected to her physical body and to physical nature, all as one. Since this is my obstacle, I’m not all that, not unabashed, confident, or connected to my body and to nature in a way that I need to be. Who do you see in that card? My eyes are pulled toward the symbolist art on the woman’s naval. For me, the naval area is the seat of personal power. The art there, presumably hand-rendered by a person with intention, emphasize that seat of personal power. Cultivation of my seat of personal power is relevant to this divinatory message about the obstacle I currently face. What is happening? I see a woman in mundane meditation position, in solace, shielded by a tall tree that is extending down fruit to her, as offerings. (I say “mundane” because that particular sitting position is how “normal” or lay folk sit for meditation, in contrast to how a monk after advanced cultivation might sit. Long story. Really specific to my own upbringing, the tradition I was raised with, and what I learned. Forget I said anything.) So part of the message here for me is related to my path in self-cultivation and my lay meditation practices. This is interesting, and specific, and spot on. What symbols leap out at you? What do those symbols mean to you? Now I’m pulled toward the tree, which to me, symbolizes growth, strength, resilience, and wisdom cultivated over time, experience, and years of life. My obstacle now is that final hurdle– how to advance my metaphysical practice in a way that brings greater Understanding, with a capital U. That’s the obstacle I face. Which color dominates on the card? What is the color symbolism here? I’m drawn to the equivalent dominance of magenta and orange. Magenta is this blend of violet and red, which evokes spiritual development and personal power, both themes that have already come up in the other inquiries of this five-step intuitive approach. Orange is creativity and using my personal energy in a creative way. So that’s what I got out of the card I drew, based on Huzska’s recommended inquiries. When it comes to intuitive reading, even if you selected the “Obstacle” card and are now looking at that Ten of Cups through those five questions, what you get out of it may be totally different from what I get out of it. 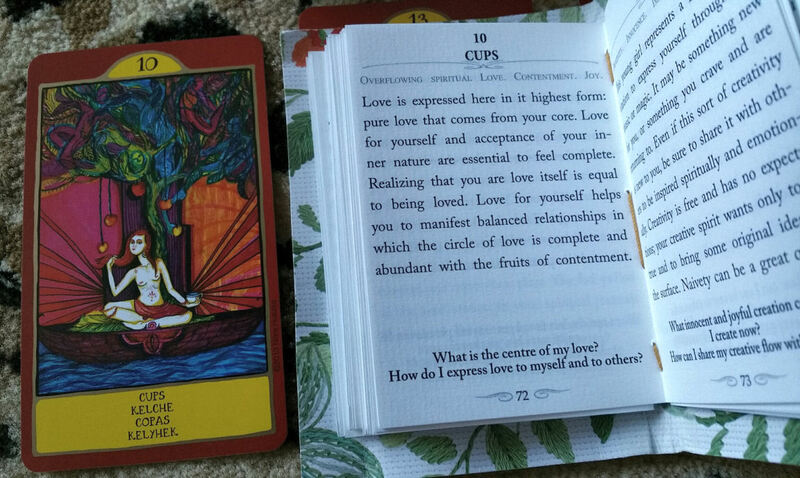 What the Ten of Cups as an Obstacle card means for you as a divinatory message, filtered and translated through those five questions, is not going to be the same divinatory message the Ten of Cups as an Obstacle card holds for me. That’s the beauty, the art, and the power of reading tarot intuitively here, and the Gypsy Palace Tarot lends itself remarkably well to a creative-intuitive reading approach. Now let’s read the accompanying entry for each card in Huszka’s Rough Guide. You can click on any of the below photos for an enlarged view of your card. Follow the five-step inquiry for an intuitive read. Then compare your ruminations with what’s written in the Rough Guide. Now, note the additional two questions in the Rough Guide. Answer those for yourself. Remember: you can click on the photograph to enlarge. 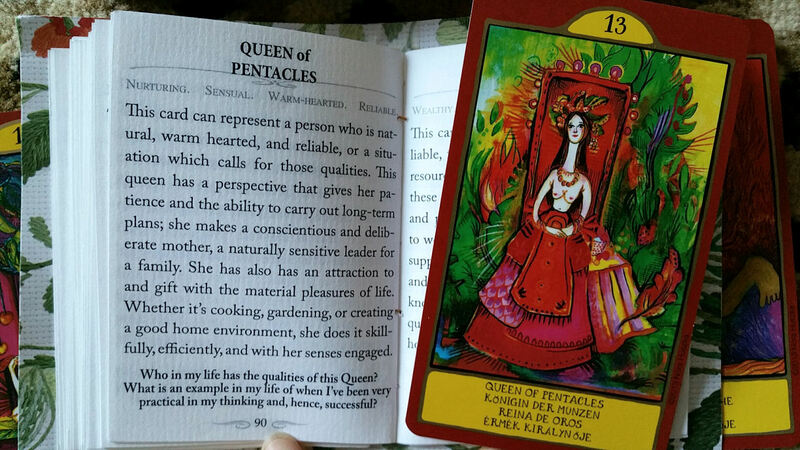 If you had picked “Situation,” then your card is the Queen of Pentacles. Compare your ruminations per the five-step inquiry with what is written in this entry from the guidebook. There is a sense of motherhood and matriarchy here. How might that apply to understanding your current situation? Think about nurture and mastery over the domestic sphere. Also note the two questions at the bottom of the entry page. How would you answer those questions for yourself and how might it reveal further insights to your current situation in life? If you chose “Key” and you want to get straight to the point, to know the solution, your card is the Queen of Cups. You’ll have run through the five-step intuitive inquiry, presumably. Now consider that in conjunction with the entry in the guidebook for the Queen of Cups. 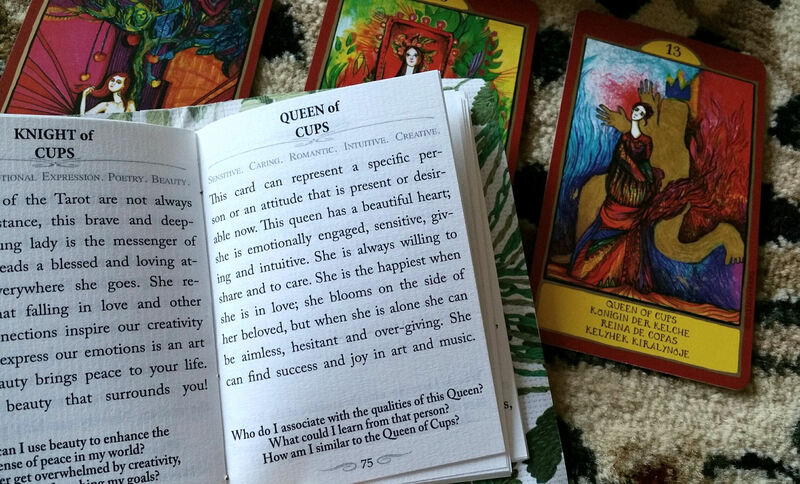 The answer you seek could be an actual individual, a woman who embodies the Queen of Cups. Or it could represent desirable traits that you’ll need to develop to become the key and manifest the success you seek. Here, the relevant traits are sensitivity, generosity, kindness, compassion, and emotional balance. Art or music could also be relevant to finding your key. Now read the three bold-faced questions at the bottom of that entry and answer them for yourself. There is a power and confidence about this deck that you’ll want to work with. You’ll want to tap into those energies through the Gypsy Palace Tarot and see how it enhances, augments, shifts your own divinatory practices. Check out Huszka’s Etsy shop and order your copy of the Gypsy Palace Tarot today! If you’re even a little bit witchy or the bohemian spirit is strong in you, then you are going to take to this deck like fish to water. FTC Disclosure: In accordance with Title 16 of the U.S. Code of Federal Regulations Part 255, “Guides Concerning Use of Endorsements and Testimonials in Advertising,” I received the Gypsy Palace Tarot from Nora Huszka for prospective review. Everything I’ve said here is sincere and accurately reflects my opinion of the deck. i just got this deck in the mail today!!! it is gorgeous!! i’m a complete newbie at tarot so i’m glad you said it’s a good “intuitive” read since i’m still just starting…awesome review! Benebell, I have this deck and the Rough Guide (Black leather with red stitching)………the box has #13 on it with Nora’s autograph. The colors of the Gypsy Palace deck really pull you in, but I had no idea of the power in there until I read your review. All I can say is : When will you be coming east to teach at a Tarot Conference? I live in New York, and would LOVE learn from you. Notwithstanding the intelligence in all of your writing, there is the FUN, CURIOSITY, and EXPLORATION that makes Tarot/Cartomancy the adventure it is meant to be.